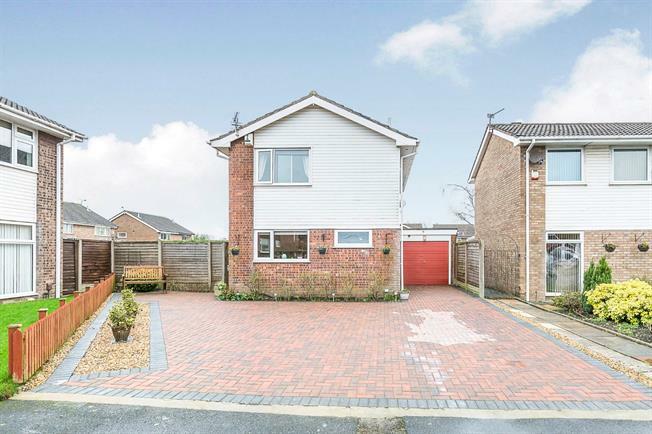 This substantial detached three bedroom home has been mindfully designed to provide an exceptional family home of quality. This attractive property boasts a wealth of potential and offers excellent family accommodation set on a much larger than average plot amongst beautiful private and mature gardens. You are welcomed to the home via an entrance hallway with downstairs WC and staircase leading to the first floor. The hub of this fantastic home is the spacious light and airy 'L' shaped lounge diner with sliding patio doors opening onto a conservatory, allowing the space to be filled with natural light and perfect for bringing the outside in. There is also a fairly modern fitted kitchen with space for your appliances. Upstairs, you will find three generously proportioned bedrooms, two of which are doubles and a luxurious three piece bathroom suite. Externally, the property is approached via a large hard-standing block paved driveway leading to a single garage. Beyond the access point to the garden is a beautiful mature laid to lawn garden surrounded by many trees, borders and a wonderful scenery. View to appreciate. Composite double glazed entrance door. Double glazed uPVC window facing the side. Radiator, karndean flooring. Staircase leading to the first floor. Double glazed uPVC window facing the front. Radiator, karndean flooring, part tiled walls. Low level WC, pedestal sink. Aluminium sliding double glazed door. Double glazed uPVC window facing the rear. Radiator and electric fire, carpeted flooring. UPVC French double glazed door, opening onto the garden. Double glazed uPVC window facing the rear. Tiled flooring. Double glazed uPVC window facing the front. Radiator, laminate flooring, tiled splashbacks. Roll top work surface, fitted wall and base units, stainless steel one and a half bowl sink with drainer, integrated, electric oven, gas hob, over hob extractor, space for washing machine, fridge/freezer. Loft access . Double glazed uPVC window facing the side. Radiator, carpeted flooring, built-in storage cupboard. Manual up and over door. Power sockets and lighting. Hardwood rear door access leading to the garden.